All my woods are naturally air-dried. In 1988 I started buying and storing wood - sometimes whole trees - which means I have ready access to a large, varied and well-aged stock of woods. I almost exclusively use Spruce from the Austrian Alps and the Bohemian Forest for the soundboards. I have a particular preference for Bearclaw Spruce which I have been working with for many years. This wood has aesthetic and acoustic properties that have always impressed me. It goes without saying that I also build instruments with Canadian cedar soundboards. The wood I use mostly for constructing the backs of the guitars is East Indian Rosewood. Other woods in this price class I can offer are flamed or bird’s-eye maple, or yew (in limited quantities) as alternatives to Rosewood. For more expensive instruments I can offer the choice between Brazilian Rosewood and Ziricote. Additionally, I am proud to be able to offer the very rare Satinwood (Fagara Flava) – have a look at the picture! I believe this wood has superb acoustic properties. I originally got the idea to use this wood from an exquisite guitar by Francisco Simplicio (Number 241 - 1929). Here I can offer the choice between South American Cedar (Cedro) and Honduras Mahogany. The standard fingerboard is Ebony. Over the years of my association with the Spanish guitar, I have often come across the so-called “tornavoz”, a metal conical megaphone-like structure fitted to the inside of the sound hole extending a few centimetres into the instrument. Technically speaking, it lowers the fundamental of the resonance body. It serves to focus the sound and improve the sound projection of the instrument. Antonio de Torres as well as his contemporaries and successors often used this “sound funnel” in their work. The disadvantages of this feature include a rather “indirect” feel for the player as well as difficulties in accessing the inside of the body for repairs. My “variation on this theme” is a wooden ring fitted to the inside of the sound hole extending about 17mm (2/3rds of an inch) into the instrument. This has a substantial effect of the sound without limiting access to the inside of the body for repairs. 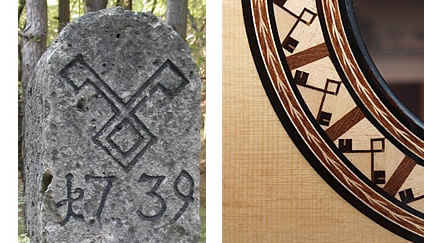 The design for my one of my rosettes relates to a regionally historical motif. On the street where I live there is a boundary stone dating back to 1739, which depicts a pair of crossed keys. This was the part of the coat of arms of a regional legislative authority (the district of Melk in Upper Austria) on which I have modelled my inlays. I offer a lifetime guarantee on the woods and workmanship of my guitars. This naturally implies correct handling of the guitars as well as regard for appropriate humidity and temperature levels when storing the instruments. This guarantee does not include frets, lacquer, tuners or the standard case provided (Hiscox Pro-Line) neither does it cover other parts subject to wear nor parts fitted by someone other than myself.